Bird flu (H5N1) is a type A influenza, causing an infection that most commonly affects wild birds. The infection can also spread to poultry. In rare cases, the virus can cause disease in people who have direct contact with sick birds. A source of infection in humans are birds carrying the virus – domestic or wild (mainly waterfowl). Infected birds release the virus with saliva, nasal discharge, and feces. It is considered that risk exists also in the consumption of non-thermally processed poultry products. Have been in contact with an infected bird. Pneumonia resulting from bird flu is aggressive and leads to the development of the so-called acute respiratory distress syndrome. Nearly 60% of the patients with bird flu develop complications. Do not consume raw poultry products. Antivirus therapy is performed with Oseltamivir and Zanamivir. The symptomatic remedies for the treatment of bird flu are basically the same as for any other influenza infection – antipyretics, anti-cough remedies, vitamins, as well as a suitable home or hospital regime. Swine flu (H1N1) is a type A influenza, affecting pigs, or a form of human flu, caused by a related virus. In the past it affected only by people, having direct contact with pigs. Several years ago a new virus emerged that spreads among people, without contact with pigs. Most of the affected people are between 5 and 45 years old. It is considered that the virus is no more dangerous than a common influenza virus. The severity of the disease ranges from very mild to severe cases leading to death. Most people infected with swine flu are recovering without antiviral treatment and medical care. The virus spreads from person to person. The infection is transmitted easily, via droplets, coughing or sneezing, it is inhaled or transmitted by hands that have previously touched contaminated surfaces. Sick people can infect others within 7 days after the symptoms have occurred. 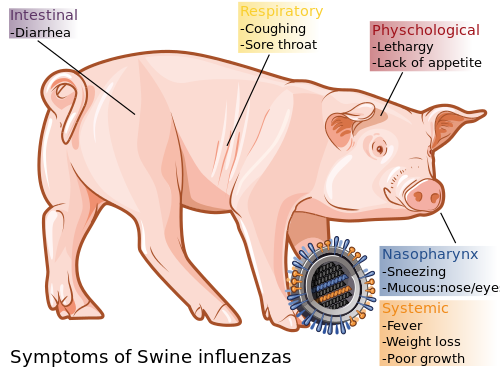 The symptoms of swine flu are similar to the symptoms of other flu types. Only a test can indicate the type of virus. The H1N1 virus is demonstrated by the polymerase chain reaction method that detects its nucleic acids. One of the most common complications of swine flu is the development of pneumonia. Vaccination is the most effective way to prevent swine flu and is widely used. In most cases, symptomatic remedies, fluid intake, and rest are sufficient treatment for the swine flu. It is successfully treated with Oseltamivir and Zanamivir, but such treatment is only necessary if there is a risk of developing complications. Bird Flu: Bird flu (H5N1) is a type A influenza, causing an infection that most commonly affects wild birds. Swine Flu: Swine flu (H1N1) is a type A influenza, affecting pigs, or a form of human flu, caused by a related virus. Bird Flu: A source of infection in humans are birds carrying the virus – domestic or wild. Swine Flu: In the past a source of infection in humans were infected pigs. Several years ago a new virus emerged that spreads among people, without contact with pigs. Bird Flu: The risk of bird flu development is higher in people who work in poultry farms or with raw poultry materials, travel/live in countries affected by bird flu, consume thermally untreated poultry products, have been in contact with an infected bird. Swine Flu: Most of the affected people are between 10 and 45 years old. Bird Flu: People can be infected with the virus by direct contact with infected birds, contact with objects and surfaces contaminated by infected birds, contact with secretions and feces, and in very rare cases – in close contact with sick people. It is considered that risk exists also in the consumption of non-thermally processed poultry products. Swine Flu: The virus spreads from person to person. The infection is transmitted via droplets, coughing or sneezing, it is inhaled or transmitted by hands that have previously touched contaminated surfaces. Bird Flu: The prevention of bird flu includes avoiding direct contact with wild and domestic birds, not touching objects and surfaces contaminated with bird feces or secretions, maintaining a very good personal hygiene, not consuming raw poultry products. Swine Flu: Swine flu prevention includes avoiding confined spaces with many people, wearing a mask, maintaining very good personal hygiene, avoiding contact of hands with eyes and mouth, avoiding contact with sick people. Bird Flu: Currently, the specific bird flu prophylaxis through vaccines is limited mainly to people at risk of contagion. Swine Flu: Vaccination is the most effective way to prevent swine flu and is widely used. Bird Flu: Nearly 60% of the patients with bird flu develop severe complications and die. Swine Flu: It is considered that the swine flu is no more dangerous than a common influenza virus. Bird flu (H5N1) is a type A influenza, causing an infection that most commonly affects wild birds. Swine flu (H1N1) is a type A influenza, affecting pigs, or a form of human flu, caused by a related virus. A source of bird flu infection in humans are birds carrying the virus – domestic or wild. A source of swine flu infection in humans in the past were pigs. Several years ago a new virus emerged that spreads among people. The risk of bird flu development is higher in people who work in poultry farms or with raw poultry materials, travel/live in countries affected by bird flu, consume thermally untreated poultry products, have been in contact with an infected bird. Swine flu affects mostly people between 10 and 45 years old. People can be infected with bird flu by direct contact with infected birds, contact with objects and surfaces contaminated by infected birds, contact with secretions and feces, etc. The swine flu spreads from person to person via droplets. The prevention of bird flu includes avoiding direct contact with wild and domestic birds, not touching objects and surfaces contaminated with bird feces or secretions, maintaining a very good personal hygiene, not consuming raw poultry products. Swine flu prevention includes avoiding confined spaces with many people, wearing a mask, maintaining very good personal hygiene, avoiding contact of hands with eyes and mouth, avoiding contact with sick people. 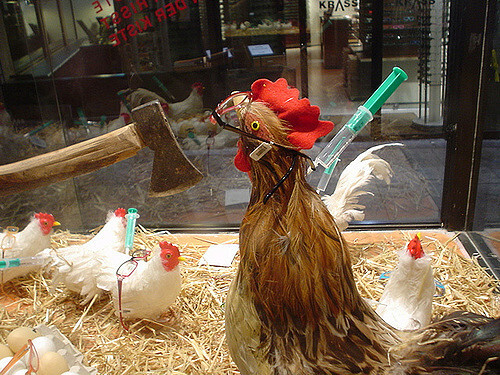 The bird flu prophylaxis through vaccines is limited mainly to people at risk of contagion. Swine flu vaccination is the most effective way to prevent the disease and is widely used. Nearly 60% of the patients with bird flu develop severe complications and die. The swine flu is no more dangerous than a common influenza virus. Dr. Mariam Bozhilova Forest Research Institute, BAS. "Difference Between Bird Flu and Swine Flu." DifferenceBetween.net. April 9, 2019 < http://www.differencebetween.net/science/health/difference-between-bird-flu-and-swine-flu/ >. Siegel, M. Swine Flu: The New Pandemic. New York: Wiley. 2009. Print. Stones, M. Bird Flu Pandemic. Bloomington: iUniverse. 2006. Print. Wiwanitkit. V. Swine Flu and Pig Borne Diseases. New York: Nova Biomedical Books. 2009. Print.